During the Picnic Club Detroit visit to Rouge Park, I did a quick lesson on Garlic Mustard which is an invasive plant here in Michigan. It came to our region by way of Europe as a culinary herb that tastes very much like it sounds. Spicy and garlicky. It is edible, but it has never really caught on as a crop. Instead it finds its way in to parks and green spaces and goes crazy. I have been experimenting with different invasive plants to determine which ones would make viable fibers for paper making. 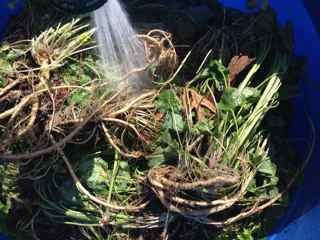 Generally, once removed from a site, these plants get thrown away or incinerated. As an artist I am interested in reframing these invasive by-products. Is there a way in which we can safely use them to make viable products, projects and learning opportunities? And what is our relationship, as artists, to the materials that we use to create works? 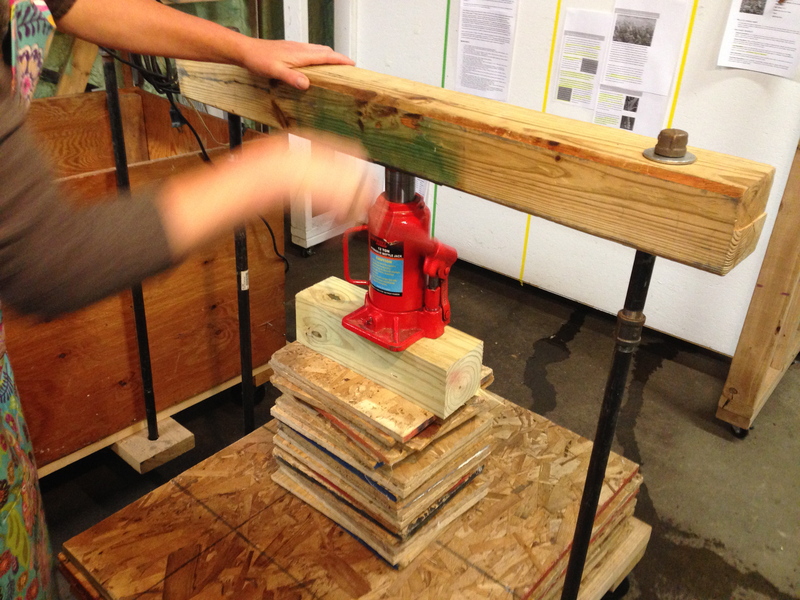 How can we stretch and challenge what and how we use materials? Along with the help of some fabulous and diligent Detroit Picnic-ers we were able to remove over 8 pounds of the plant. I am happy to report that after going back to the site where we removed the plants, they have remained at bay. In order to begin the papermaking process, I throughly cleaned and rinsed the plants to remove dirt, sticks, and anything that might damage the Hollander Beater (an essential papermaking tool). 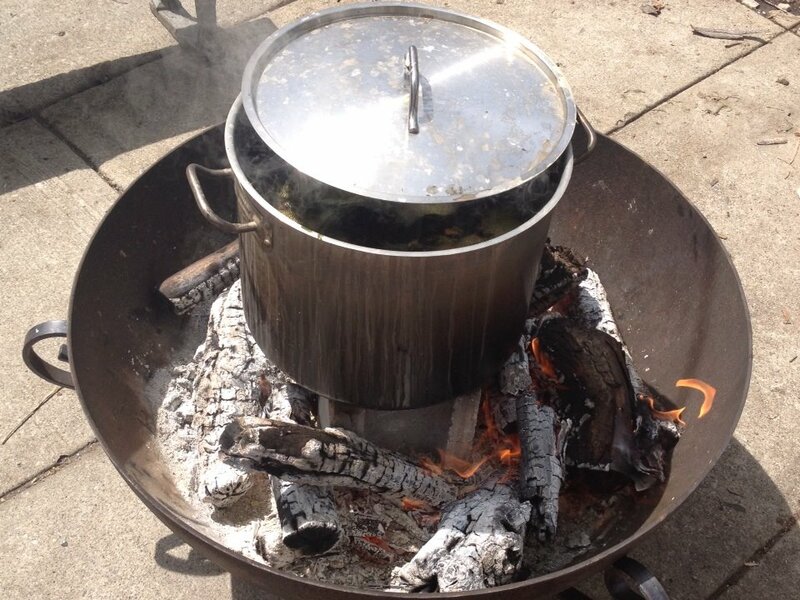 I then cooked the plant fibers until the cellulose began to break down over the fire. The cooked fibers get transferred to the Hollander Beater where they get macerated and the cellulose breaks apart completely – allowing for the papermaking process to form new cellulose connections. * The Hollander Beater pictured here is not my own. And the fiber is NOT garlic mustard. My pictures did not turn out but I wanted to make sure folks got the idea. 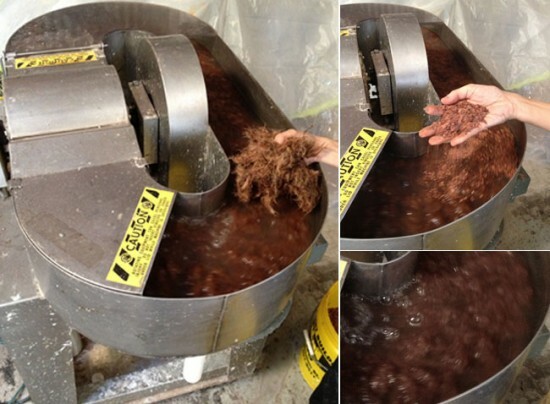 Once pulp has formed, it is transferred into a bin and sheet forming begins. 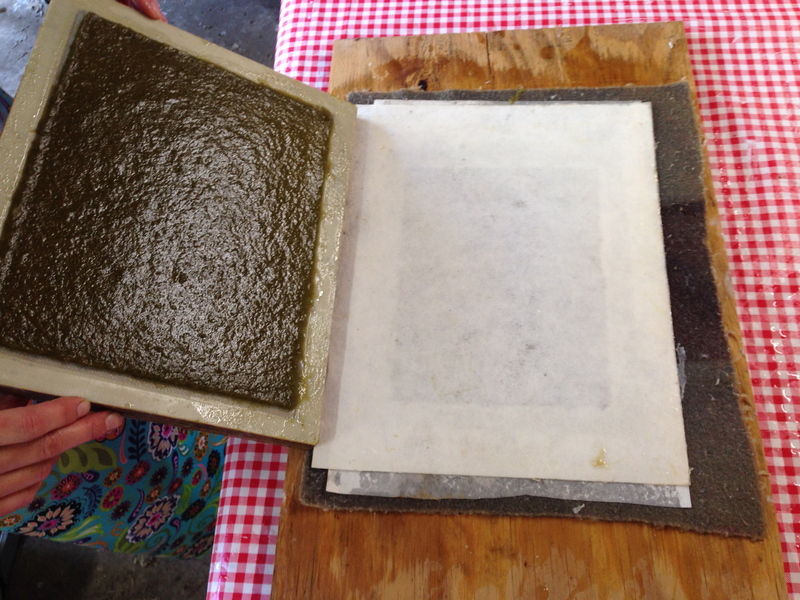 Once sheets are formed, they are stacked and then pressed to remove excess water and compress the fibers together. 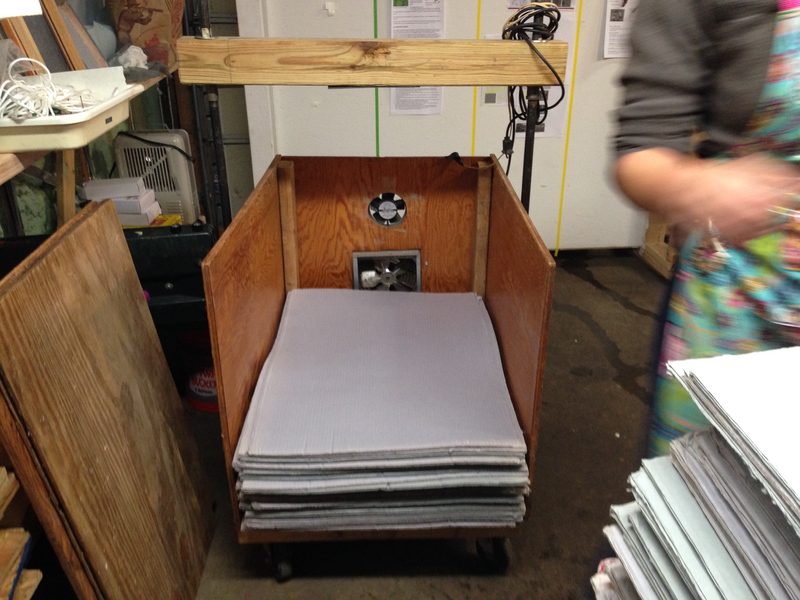 The sheets are transferred to blotters and into a “dry box” which forces air through them in order to dry faster. Below are the finished sheets! The first set was finished in the dry box, giving them a smoother finish. 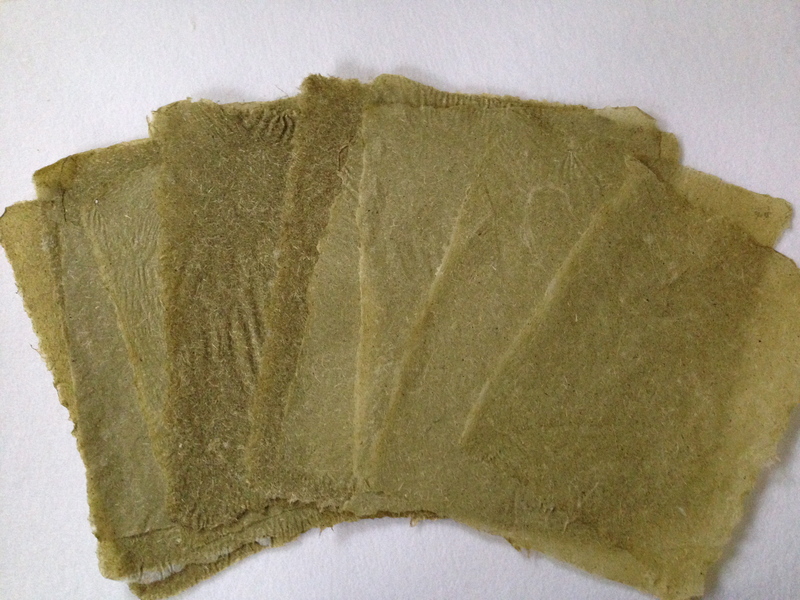 The second set was air-dried and they are much more wrinkled and varied. 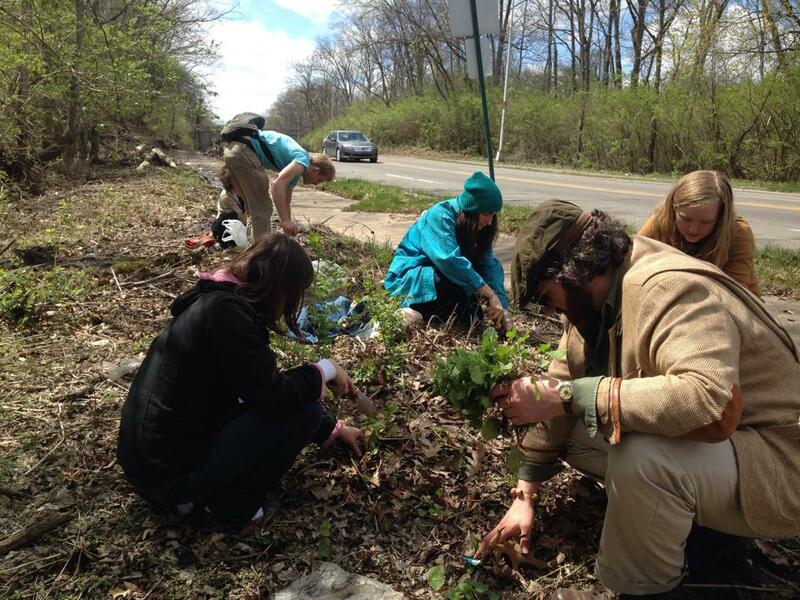 Thanks to all who came out to learn, to forage, to explore and to help remove Garlic Mustard. On Sunday May fourth the picnic club met up with artist Meg Heeres in Rouge Park. 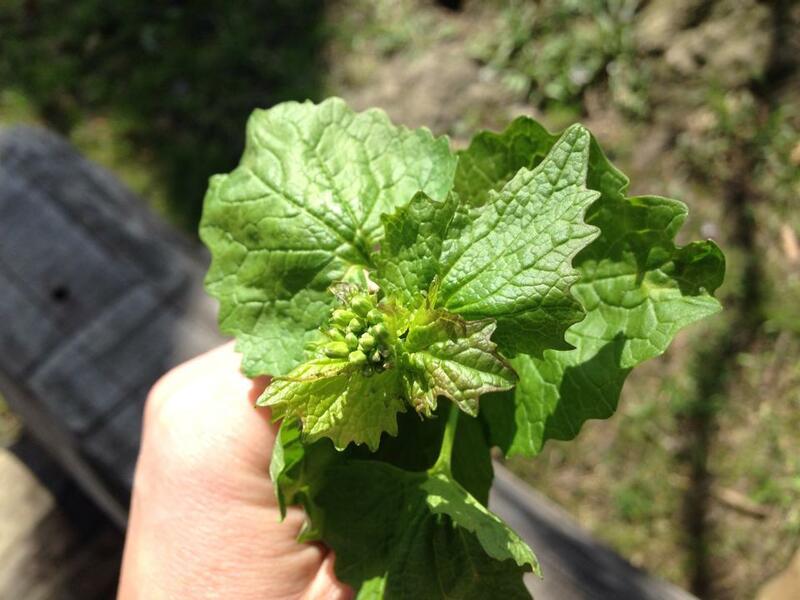 Meg guided us on a walk, in search of garlic mustard, an invasive plant that she plans to transform into paper. Along with collecting garlic mustard for paper production we also created photograms, ate snacks, looked closely at plants and trees and found beautiful objects. The evening before the picnic, sheets of paper were coated with liquid emulsion in a dimly lit basement (We used a cyanotype kit purchased from a company called the Photographer’s Formulary). 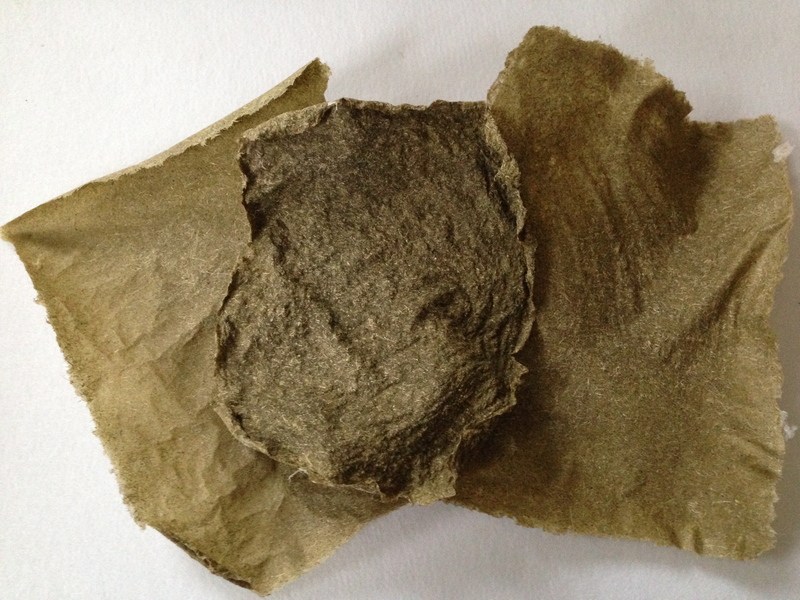 Some of the paper we used was paper that Meg Heeres made from honey suckle (another invasive plant) and Abacá fiber. Throughout the picnic we looked closely at the shapes of plants and branches, collecting the ones we liked to create images with their shadows. The process was incredibly fun. The uncontrolled aspect of this process yields some beautiful unexpected affects. This picnic was different then that last (Birdwatching within the Barricades) because it engaged all of us in the act of making. I have found that my location in the world and the creative impulses I experience are inextricably linked. The act of making creates a new intimacy with the place I inhabit. Making helps us to see new aspects of our world as active participants in the shape of things rather than a passive set of eyeballs rolling around a varied topography. 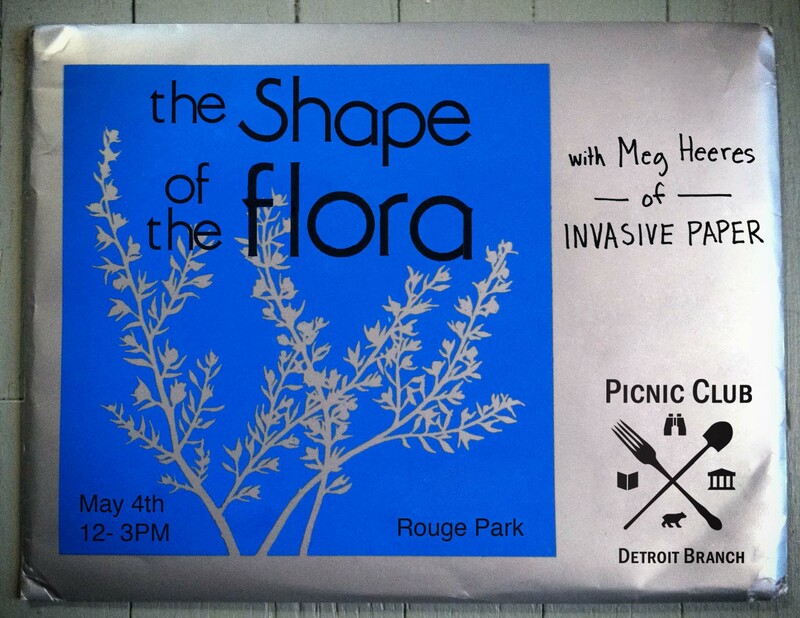 After the picnic Megan Major (a Detroit based photographer and fellow picniker) said that she would be exploring photogram printing more. I can’t wait to see what she makes! Check out some of her beautiful and ethereal work here. Thanks so much to Meg Heeres for sharing her world with us! Also Huge thanks to Michael Collino, Lauren Rossi Harroun, Shana Merola, Emily Gustafson, Augusta Rose and all the lovely picnikers who bring curiosity and creativity to each picnic! 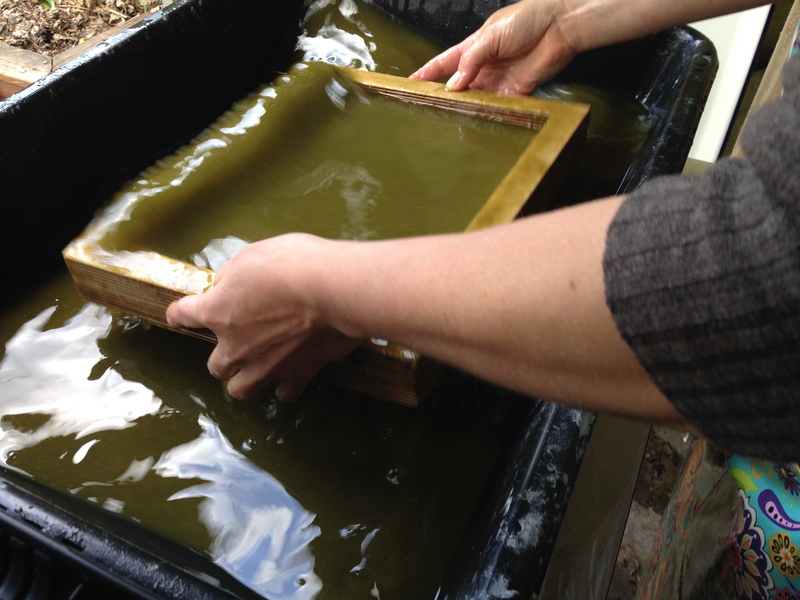 We will also be providing a limited amount of cyanotype paper to make photograms with some of the treasures we find. If you wish to make one, please consider bringing a small donation. The exact location of the picnic is by the intersection of West Outer Drive and Tireman Avenue. If you don’t see us from the road, look for clues, practice your tracking skills, and you will find us in the woods.